What's so special about this cruise? In simple words: this kind of a holiday is a unique experience and not only out of our view: the best way to spend your holiday in Turkey. The Blue Cruise is the ultimate vacation as you sail along the beautiful coast of Turkey while getting away from routines and exploring the many coves. You will be surprised at how reasonably priced the Blue Cruises are. Blue Cruise is the term used to describe taking a yacht on the Aegean and Mediterranean coast of Turkey, this traditional built, handmade wooden boat, called a "goulette" or "gullet". Boat building in Bodrum. It has as its heritage in those ancient wooden boats which have sailed across the Aegean and Mediterranean Seas for thousands of years both fishing and trading. Nowadays boats are specially built for the charter market with fittings and equipment designed for guest's comfort, all of them come under the collective description of a wooden Gulet. 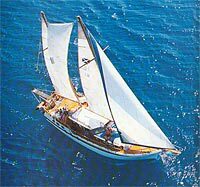 The Gulet is typically built of pine wood and styled with a pointed fore and round aft. The spacious aft deck is designed for dining and lounging in the shade of a sun awning and a forward deck invites with numerous sunbeds. All of our gullettes have double cabins with en-suite facilities, some have twin beds. Gulets range in size, accommodating from 4-20 people. The crew, a captain, cook and 1 or 2 deckhands are very experienced at handling the boat and catering to all your needs. They might not all be experienced to sail, but when the wind gets strong enough they will, if the clients insist. You may chose between hiring your own Gullet full boat charter (choose from more then 20 gullets) with your friends or you may rent a cabin on a yacht and make some new friends. You may choose as well the routes of your cruise. Here is our new interactive map of the area, so you can get an idea of the region we suggest. You can spend all of your time on board of the gulet if you like. The captain and the crew are continuously at your disposal in an effort to provide you with all your needs. Or anchoring in a cove and trekking in the wild nature, visiting a nearby village and coming closer to the native people and their traditions or visiting one of the numerous ancient sites. Here, in the midst of the idyll, you can feel the touch of nature and history. The delicate Turkish wine and "raki" (national alcoholic spirit) contribute to this delight. The Turkish cuisine is considered to be among the finest in the world. The cook pampers you during the whole voyage with specialties and samples of the delicious Turkish cuisine, of which you surely will be a fan at the end of the voyage. You will be served with three meals a day: breakfast, lunch and a three-course dinner in the evening. If you have any special dietary requirements (if there are certain foods you dislike or mustn't eat), simply let him know. He will be able to prepare dishes to suit your exact taste. Dining is generally outdoors around a large table on the aft deck although there is a separate dining area in the main saloon. A sun awning provides shade and there is ample space for for everyone on the cushioned sun decks. When you decide for private boat charter, You may choose between Fullboard (3 meals + teatime) price € 26,- p/person per day or halfboard at € 19,- . Soft Drinks and alcoholic drinks are extra, we can buy them at supermarket prices and you just pay us the bill plus a service-extra for the crew of only 10%: We think that's a fair offer and all previous guest did appreciate that very much. For the safety of children, special care has been taken to ensure that the rails around the decks are sufficiently high. In addition, crews of the Holiday Gulets are particularly instructed to assist parents in ensuring the safety of their children during all aspects of life on board. Turkey is a fascinating and friendly country where you can soak up the history of ancient civilizations, but also enjoy the atmosphere of market towns and villages. Whether on land or sea the scenery is spectacular. The Mediterranean and Aegean areas are still surprisingly unspoilt. The coast line of south western Turkey is consistently chosen by sea lovers from all over the world as the most beautiful cruising area of the Mediterranean. If you are interested in history and archaeology, you will agree that these shores are like on open air museum. Troughout your excursion you will see remains of amphi-theatres, markets, churches, tombs and towns of Lydian, Lycian, Carian, Ionian, Dorian, Hellenic and Roman civilizations. In addition to historical places, you can always find out for yourself what current life is like in our cozy little Mediterranean towns, and admire the local arts and handicrafts. The Weather and what's the best time for a cruise. Turkey's climate also contributes to the cruising excellence of this area with a season that can begin in April and end in October. June, July and August are of course the hottest months. May and September cooler and quieter and April and October still offering 8 to 9 hours of sunshine a day, with the opportunity for walking and exploring as well as cruising. Not all Holiday Gulets have the same features. Please ask us to provide you with our Gulet Catalogue to see the specifications, equipment and layout of each of the yachts we offer. To be able to help you to choose the most suitable yacht and itenerary, we need to know the composition of your group and your special interests and priorities amongst the followings: Visiting historical sites, natural beauty spots, towns and villages, water-sports, swimming, diving, snorkeling, relaxing in secluded bays and in fact, any other special requirements you may have. May we remind you that each alternative route you wish to take along the Turkish Riviera will give you a chance to experience a different combination of these activities during your cruise. Once on board, one of our staff and later during the voyage the captain will present you daily with the range of possibilities and if you wish make suggestions or leave you decide your own program during the cruise. © pixelwork bodrum 1998-2016. All Rights Reserved.